Our Soft Maremma Grappa is a top quality grappa made from a careful selection of our Sangiovese pomace. The pomace retains all the characteristics of its wine and terroir of origin and is packed with alcohol and aromas as a result of its long skin contact period. Our grappa is distilled and bottled for us, using artisan discontinuous distillation methods, by Nannoni Grappe s.r.l., an artisan firm which won the highest 5 Grappoli award in the Le Migliori Grappe d’Italia Bibenda 2017 guide. After pressing, the pomace goes into the traditional steam alembic stills, which preserve the aromas of the base grapes intact. The impurities are eliminated during distilling, and the grappa clears. Then it is placed in precious wood barrels to age for years in special cellars. As it ages, the grappa acquires a dry, delicate aroma and a pleasant, clear flavour. The quality of the raw material, together with an ultra-meticulous traditional working method, makes for a unique product. 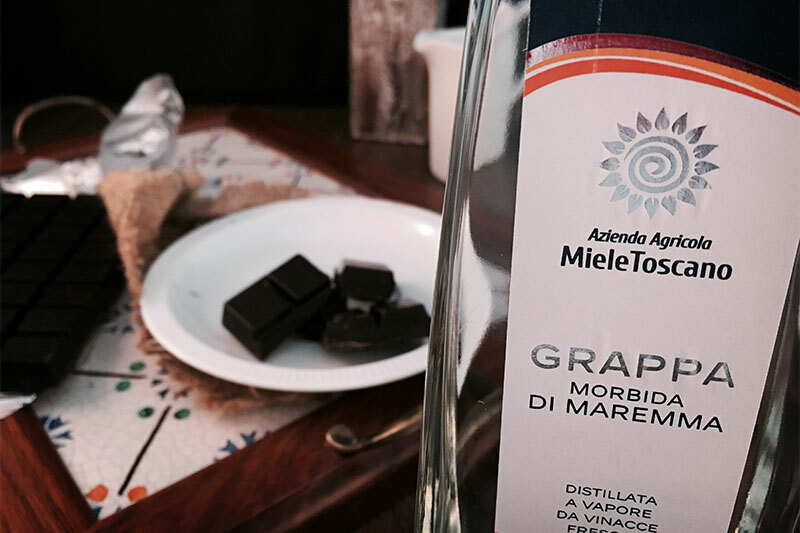 A soft grappa with a pronounced, unmistakeable aroma, obtained by distilling fresh grape pomace from selected Sangiovese grapes. It is a grappa for all occasions, much loved by the young but also by the most exacting and expert consumers. Formats available: 500 ml bottle.